Imagine.. Someone out there is climbing a thousand metres up a mountain to handpick fresh roses for you xD Isn't that romantic?? In the new Shills Damascus Rose Skin Care Series, precious essential oil (they call it liquid of gold!) is carefully extracted from the Damascus Rose which grows on Bulgaria Mountain. No chemicals or artificial substances are added to it. To produce 1 kg of the rose essential oil, 4000 kg of fresh rose petals are needed! 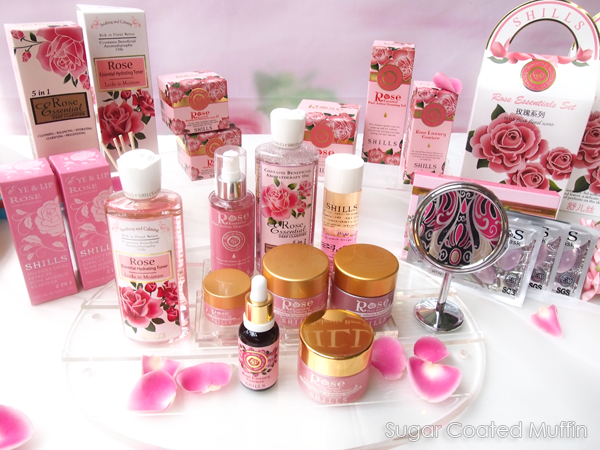 The whole range is super pinkish and smells of this lovely rose scent that is so romantic and relaxing. 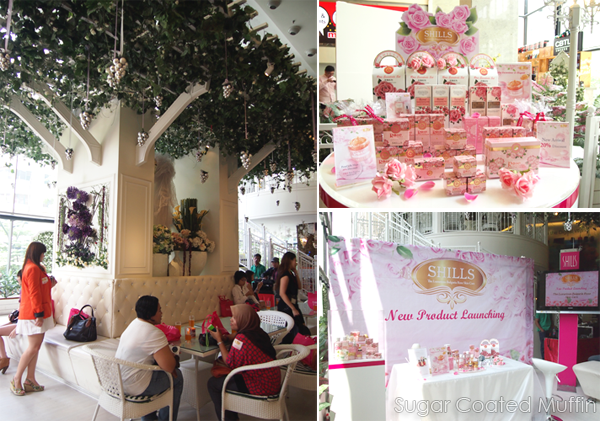 The launching was held at Garden Cafe which was perfect with it's beautiful garden setting. We were greeted by these 2 young dancers who could really shake! Next up was a demonstration by Eva. First step of skincare is to remove makeup and dirt on your face. Eva is using the 5-in-1 Rose Essential Deep Clarifier (RM79/250ml) which functions as a makeup remover, cleanser, exfoliator, moisturizer and sebum controller. It's really unique because as you massage it, it turns really sticky and you can just pull it off along with the dirt. The Rose Essential Duo Action Cleansing Gel (RM79/100ml) acts as a 2 in 1 makeup remover + cleansing gel which also keeps skin hydrated. 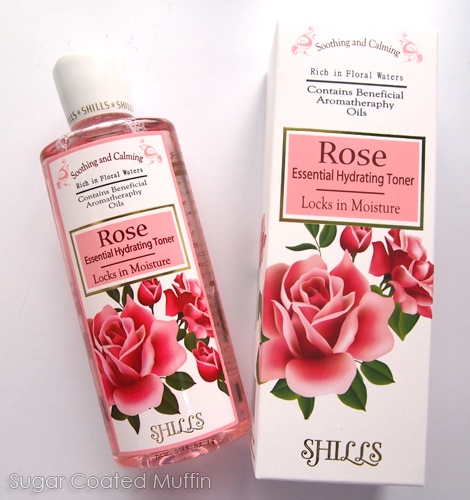 Next up is the Rose Essential Hydrating Toner (RM59/200ml) that freshens, softens and moisturizes skin. This toner can also be used as a deep moisturizing mask by soaking a a mask sheet or cotton pads in it and leaving on your face for 10 minutes. She advised us to apply the products from the middle to the outside, in an upward manner. 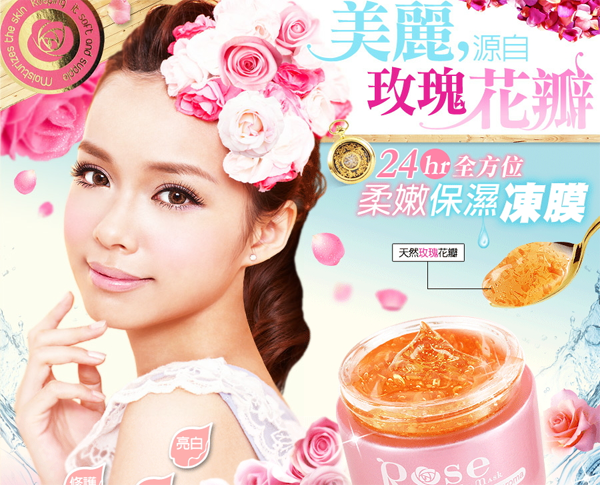 Rose Luxury Essence (RM99/30ml) improves dull skin and slows down skin aging. Tiny nano molecules penetrate deep into skin to bring out smooth, supple and radiant skin. Can be added to the day or night cream. 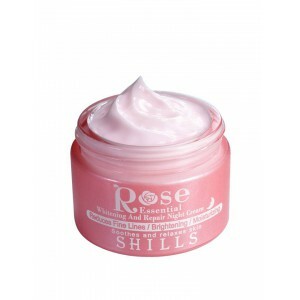 Rose Essential Hydrating and Whitening Day Cream (RM99/50ml) is a combination of Arbutin and Damascus Rose Essential that aims to improve skin moisture and elasticity while inhibiting formation of melanin and uneven skin tone. Rose Essential Firming Eye Cream (RM118/20ml) delicately eases away eye puffiness and dark circles to form a pair of radiant and glowing eyes. Also works to tighten, moisturize and improve fine lines. Rose Essential Whitening and Repair Night Cream (RM99/50ml) soothes fatigue accumulated during the day and strengthens skin's natural defenses while providing ample moisture. Despite it's creamy look, it absorbs quickly leaving skin soft and smooth. 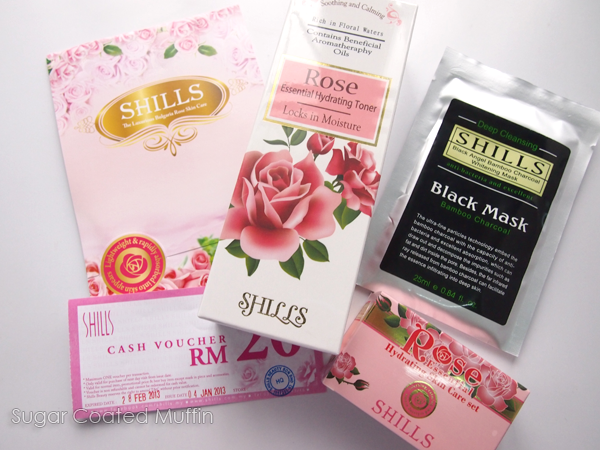 I was attracted to the Rose Petal Jelly Mask (RM99/70ml) because of it's clear jelly-like look. There are even pieces of natural organic rose petals inside! 20 minutes with this mask on will reveal skin that's smoother, brighter and moisturized. It makes skin supple and controls sebum. Eva mentioned that the jelly can be eaten and Cindy actually had the guts to try it =O Tasted like honey, apparently.. The goodies the kind people at Shills provided us with, along with the good food that afternoon. I'm giving away the Hydrating Skin Care Set at the bottom right and the cash voucher (if you want) to a reader! You just have to 'like' my FB page and comment below which product from this series do you want the most and why? Rest are optional. I will only mail to a Malaysian address, btw! Meanwhile, you can get the products on a discounted price HERE. Brightening Lift Jelly Eye Mask i can pamper my eyes yet reducing huge dark circles around my eyes before bedtime. 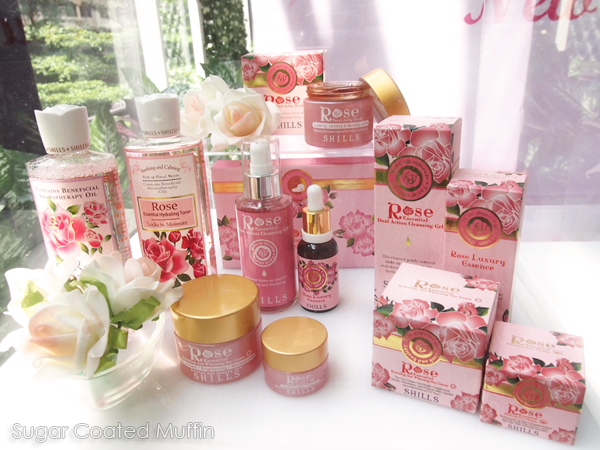 Rose Luxury Essence is the one I wanted the most because Rose essence is an excellent skin brightener & smoother! Definitely the rose petal jelly mask. Simply because I'm in need to find a mask that is right for me and the part that it is edible simply means it is really safe to use. Like the part where there are actual rose petals in it too! 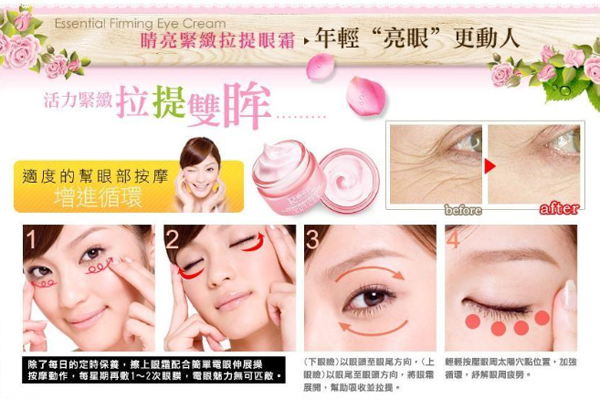 Im interested with the Rose Essential Firming Eye Cream which can helps me to reduce the dark eye circles.. 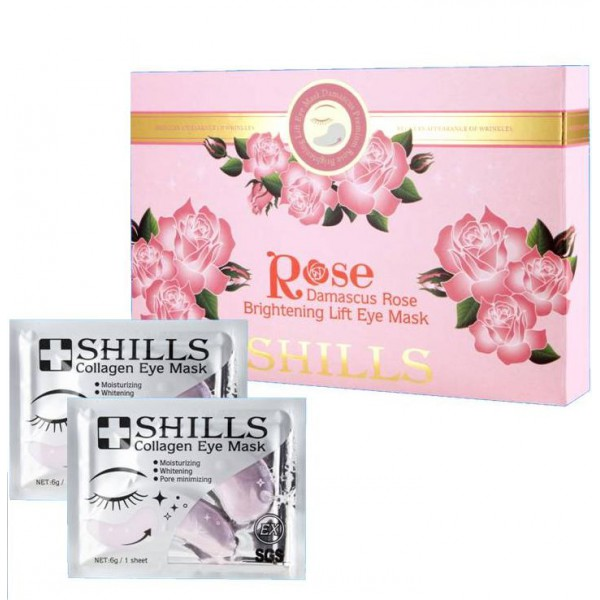 I'm interested with the Rose Brightening Lift Jelly Eye Mask. Normally the eyes' area aging faster compare to other face area (i.e. visible fine lines/wrinkles at eyes area). With this product, I hope it can reduce/prevent fine lines, firming and lifting the eyes' area. Mostly importantly, I hope it can help to make my dull eyes to be brighter every day as my works require me to work in front of desktop. Eyes are the most attractive part in any woman. I hope to have a pair of glowing eyes as sometimes eyes do the talking! you are too humble sweetie, your skin is good enough for me! 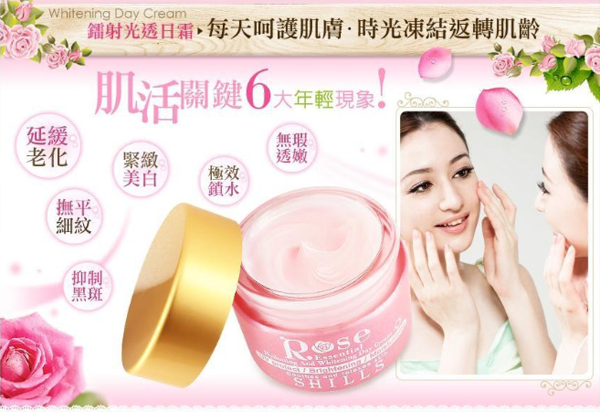 The Rose Essential Hydrating and Whitening Day Cream caught my attention because it have 2effects in one bottle which hydrates and whiten whereby my mum and me need the most. I'm interested with the Rose Brightening Lift Jelly Eye Mask.I am currently in university,resulting receiving a lot of assingment's and pulling all nighters.With all those stress I will have black circles and puffiness under my eyes.Appearance mater's alot especially the eye area.We want to have that "energized" look in our eyes,in and out.